Perhaps the greatest joy I’ve felt, watching Mike Weir’s career blossom, stems from his strong belief in family values. In fact, when Weir proudly hosted the June 21 grand opening of his new Mike Weir Winery Retail & Hospitality Centre, and Mike Weir Gallery on the Beamsville Bench, he was surrounded by family and friends as he celebrated yet another milestone in his illustrious career. The new winery and gallery is nothing short of spectacular. 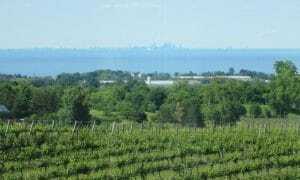 Located at 4041 Locust Lane in Beamsville, the facility boasts large window walls which allow you to look over the property, out onto Lake Ontario and – on a clear day – straight in the face of the Toronto skyline. “You can hop on a boat and go right into the city,” said Weir, grinning ear to ear not only because of the occasion, but also because he was in good company. Accompanied by family including his wife, Bricia, their daughters, Elle and Lili, his brothers, Jim and Craig and their families, and his parents, Rich and Rowie, Weir couldn’t have been happier on this occasion. “It has been a long process, but we wanted to make it right. Not just open something just for the sake of getting it open and have retail space available,” said Weir, who entered the wine industry in 2005. “It feels good to finally be here now and to have it open. It’s so different and so unique compared to any other place that’s in the region, with the open space and the great views we have here. I’m really proud of that,” said Weir. 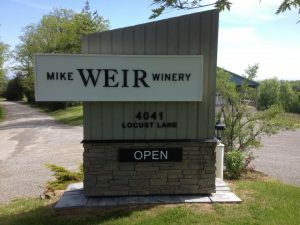 When Weir launched his first wines in April 2005, he immediately put forth a plan that sees all proceeds from his wine sales go to raising funds for and awareness of the Mike Weir Foundation. You can read about it here. Of course, we’re a big fan of Weir’s wines – you can read our latest review (Mike Weir Wine 2012 Sauvignon Blanc) here. Weir’s new retail and hospitality centre really is a special place. It may be a short boat ride to the Big Smoke, but it’s as idyllic a piece of property you’ll find anywhere on the Beamsville Bench. And with winemaker Jeff Hundertmark holding the reigns, expect the Mike Weir Wine label to continue to draw praise from coast to coast. As London Ontario Golf awarded Weir with the 2014 Heart Award (information here), the trophy now sits on display this summer at the Mike Weir Gallery. The gallery is open to the public, and doubles as a private tasting room. I’m proud to say I was one of the first visitors to step into the Mike Weir Gallery, along with Weir’s former pro, the Guv – Steve Bennett. We both got a kick out of some of Weir’s old newspaper clippings, and reminisced about Weir’s wins, including the 2003 Masters Tournament victory. Weir’s entire set of irons used during that 2003 season are on display in his gallery. And thus begins a new chapter in Weir’s life off the links. As I stated during the Heart Award ceremony June 17, Weir’s real legacy will be the work accomplished by his foundation – strongly supported by Mike Weir Wine. You can view many more photos from the grand opening here.